I have been trying to figure out ways of visually representing life in the church. One idea I have been tinkering with is using formulas. In many church meetings, we seem to struggle with not have a common language to talk about our ministry and the problems we are dealing with. When looking at attendance or money, I often hear the question “what is our problem?” From a systemic point of view though, there are several problems. How though to convey the situation easily? I worry formulas might seem inaccurate, crass, or too simplistic, and yet, the churches I serve need a common language and a way to think about our ministry. 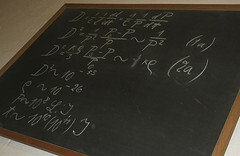 “Einstein’s Lecture notes.” ©2012 Copyright Martin Lopatka. Licensed Under Creative Commons. Next Next post: Young Clergy?